I stopped googling after that one. I had to. That little search led me to a site where I entered the dollar amount we’d like to have in the bank when we retire. It looks like we will be kickin’ it retirement style at the ripe young age of 144 and 146. Jealous? Dreams can come true. Google, Facebook, Twitter, Instagram. All very cool and powerful. Every single one is a gift and a curse. On one hand, where else can you find 14,111,292 recipes for chicken cutlets or read expert opinions about what really happened with Brad and Angelina? On the other hand, a simple “best brunch in Nashville” search can send you down virtual rabbit hole. If I wake up between the hours of 2 a.m. and 4 a.m. and the moon is in retrograde OR if the cat runs through every room of the house trying to catch a shady-looking moth OR if the dog runs the perimeter of the house barking loudly trying to protect us from a pile of leaves, I’m up for the night/morning. When this happens, the only thing left to do is to catch up on anything that happened between the hours of 9 p.m. and my wake time. Two hours later, I’ve read up on the Bubonic Plague, taken quizzes and bought a new wheat coffee guaranteed to help you lose weight and thanks to Amazon Prime, I’ll get it tomorrow. An hour after the first two, I’m still wide awake. But thankfully I’ve learned even more. It’s maddening. 180 minutes spent being totally unproductive. Except for that Beyoncé diet thing which I’ll try the following Monday. Last week after four straight nights of waking up at 3 a.m., I couldn’t take it any longer. Is my body clock or stress or my cat to blame for keeping me awake? Deep down I knew what the problem was. I’m addicted. The withdrawals started after five hours without a device. My smartphone was the drug and Verizon, my dealer. 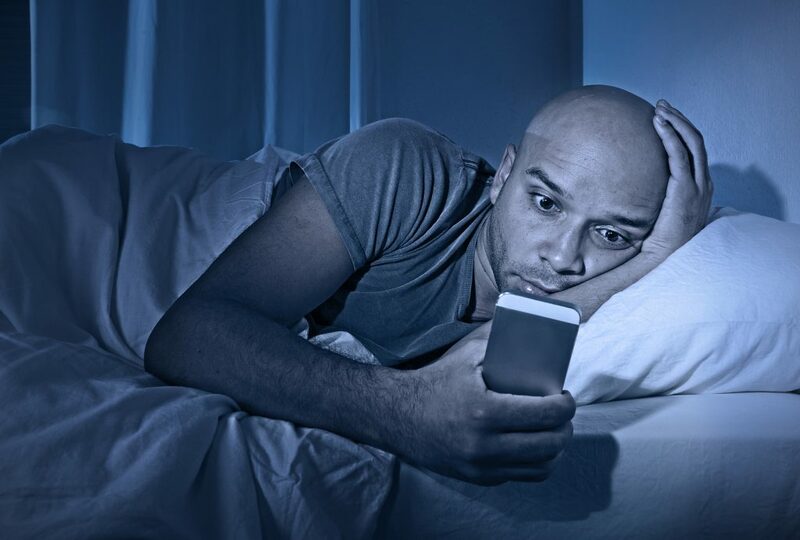 Before I could pick up my phone and type “how to quit a smartphone cold turkey,” my groggy husband rolled over, opened one eye and said, “Move your phone into the kitchen to charge.” Brilliant. That was a week ago. It’s been tough. I almost fell off the wagon when I woke up with a terrible headache early one morning. Instead of reaching for my phone and googling “when to worry about a headache,” I grabbed a bottle of water. After a few minutes, I fell asleep. It’s good to be informed, but when it comes to unlimited (and most of the time useless and unsubstantiated) information, ignorance is bliss.